Central Australia Hiatus. - Peekashu. Today is officially the last day of school for this term ! I'm soo glad that I'm done and over with all the assignments. I think I deserve a good break from school haha ! Fortunately, or unfortunately as some people put it, I'll be traveling to Central Australia with the school for the term break !! Honestly I do not even know whether I'm at North/South/East/West Australia, all I know is its be a really really really long bus ride. Why did I add the "unfortunately" ? Well because this isn't a holiday where we stay at five star hotels, sleep on clean sheets and eat lobsters. Its a road trip where we will actually camp in tents out in the desert. The total hours on the bus for this whole trip also exceeds 30 hours. Crazy I know but it'll be such an unique experience. Oh not forgetting that my lecturers are going to be with us on this trip. Which means, not in school yet in school. We will be staying underground and visiting underground home and an underground church ! Yes the beautiful Ayers Rock that is listed in Seven Natural Wonders of the World ! According to websites and magazines, the rock changes color according to season and also time of the day. It will be astoundingly beautiful. 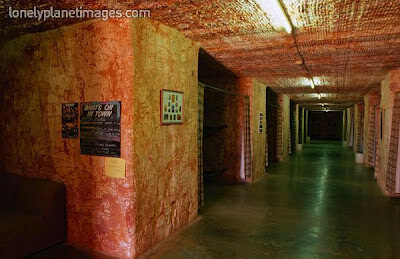 Just google pictures of Ayers Rock and you'll see. I remember seeing this in a travel magazine once at dad's office and I even listed down places I have to visit in my life and Ayers Rock was one of them ! There's also camel rides and quad bike rides along the desert. Really keen on trying out the Quad Bikes a little scared. I'm a coward I've never even tried out Go Kart before cos I scared. I also believe that I will be meeting a lot of animals like Koalas and Kangaroos on this trip. 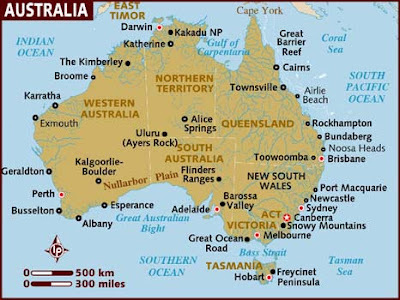 Just found this map of Australia. I assume Melbourne is at the South and you can see Uluru at the middle, right above South Australia. 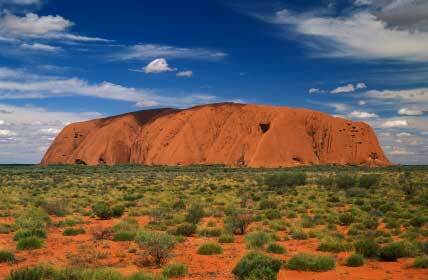 We'll be driving across Adelaide to Uluru ! This outback adventure is gonna be so tiring yet so fun. Signed up for this the day before the closing date and still wondering why I did it. I could've easily used that money to go back to Malaysia but then again, I can always go Malaysia any time I want. The trip is for 12 days so I will only be back in October. STAY TUNED for I will be blogging about the wilder side of Australia when I return !